Alefacept (Amevive) and efalizumab (Raptiva) initiated the biologic era in the treatment of psoriasis. Low efficacy for Amevive (Psoriasis Area and Severity Index 75 of 21-42 percent) and serious adverse events associated with Raptiva (namely progressive multifocal leukoencephalopathy) impeded their widespread adoption and use. Enter the second-generation tumor necrosis factor-alpha (TNF) inhibitors including etanercept (Enbrel, Amgen), adalimumab (Humira, Abbvie), and infliximab (Remicade, Janssen). These drugs provided consistent responses (PASI 75 of 51-71 percent) with known risk factors including increased infections, non-melanoma skin cancer potential, exacerbation of congestive heart failure (CHF), and/or demyelinating diseases. Etanercept is FDA-approved for moderate to severe psoriasis in patients ages four and up. Adalimumab is still a gold standard for psoriatic arthritis (PsA) and is one the easiest biologics to procure via insurance. Infliximab is still used to treat cases that do not respond to subcutaneous treatment. Next up were the IL-17 blockers including secukinumab (Cosentyx, Novartis), ixekizumab (Talz, Lilly), and brodalumab (Siliq, Ortho Dermatologics). PASI 75 ranges from 75-92 percent with these therapies. There are concerns of inflammatory bowel disease (IBD) and in the case of Siliq, suicidal ideation. By contrast, there are no concerns of CHF, demyelination, nor have increased opportunistic infections (i.e tuberculosis, histoplasmosis) been reported with IL-17 blockers. Ustekinumab (Stelara, Janssen) was the precursor to IL-23 therapy. Ustekinumab is a monoclonal antibody to the p40 subunit of IL-12 and IL-23, both released from activated dendritic cells. IL-12 differentiates and induces the colonization of Th1 cells, increasing TNF and Interferon gamma, whereas IL-23 differentiates and induces the colonization of Th17 cells, increasing IL-17 and IL-22. As it turns out, however, IL-17 and IL-22 have a more direct downstream and selective effect on the pathogenesis of psoriasis. Therefore, rather than blocking IL-17, IL-23 inhibition takes advantage of the subunits that differentiate it from IL-12. IL-23 is composed of two subunits: a p40 (identical to IL-12) and a unique p19 subunit. The IL-23 monoclonal antibodies’ mechanism of action is based on binding the p19 subunit of IL-23 and thus inhibiting the differentiation and colonization of Th17 cells. This inhibition diminishes the excessive production of IL-17 and IL-22. 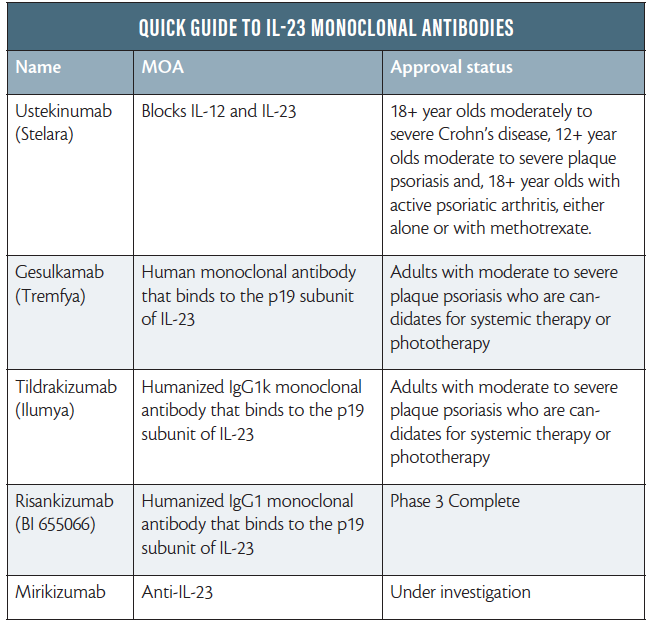 Now, let’s do a deeper dive into the fourth generation of biologics, the IL-23 monoclonal antibodies (although I prefer to call them p19 inhibitors): gesulkamab (Tremfya, Janssen), tildrakizumab (Ilumya, Sun Dermatology), the soon to be introduced risankizumab (BI 655066, Abbvie), and mirikizumab (Lilly), which is in Phase 3 development and could be FDA approved in 2020. Tremfya is a human monoclonal antibody that binds the p19 subunit of IL-23, the first p19 inhibitor to be FDA approved. It is administered subcutaneously at 100mg on weeks 0 and 4 and then every eight weeks. At week 16, PASI 75, 90, and 100 for Tremfya was 90 percent, 70 percent, and 40 percent, respectively, compared to 70 percent, 40 percent, and 20 percent with Humira. At week 16, 60 percent of those subjects who did not achieve PASI 90 on Humira did obtain PASI 90 on Tremfya. In addition, 33 percent of subjects who did not achieve PASI 90 on Stelara obtained PASI 90 on Tremfya. Fifty percent of the subjects who obtained PASI 90 on Tremfya and discontinued Tremfya maintained their response for six months. Ninety percent of subjects who obtained PASI 90 at week 28 maintained efficacy for at least three years. Adverse events noted were upper respiratory infection (URI) and nasopharyngitis. There was no cumulative toxicity during the three-year period in terms of malignancy and serious infections. Moreover, there were no signals for IBD, tuberculosis, opportunistic infections, demyelination, major adverse cardiac events or CHF.1 There are no boxed warnings associated with Tremfya. Mirikizumab is an anti-interleukin-23 therapy. It is administered at either 100mg or 300mg subcutaneously at weeks 0 and 4 then every eight weeks. At week 12, PASI 90 was achieved by 59 percent of subjects receiving the 100mg dose and 67 percent of those on the 300mg dose. Of those who do not achieve PASI 90 at week 16, 60 percent captured PASI 90 on the 300mg doseage within 16 more weeks. 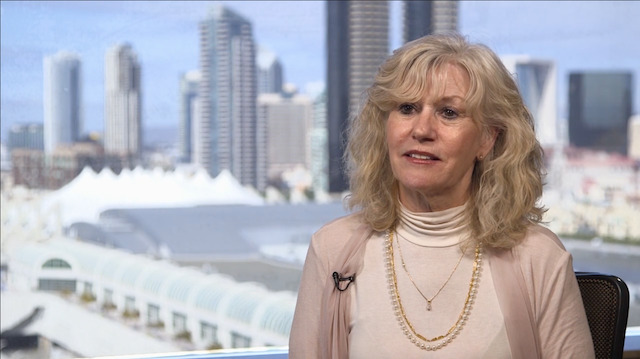 A new era of treatment with less frequent dosing, higher and more persistent efficacy, and what appears to be a better safety profile bodes well for psoriasis patients. The only question left is how efficacious this fourth generation is going to be for the treatment of PsA. 1. Blauvelt A, et al. “Efficacy and safety of guselkumab, an anti-interleukin-23 monoclonal antibody, compared with adalimumab for the continuous treatment of patients with moderate to severe psoriasis: Results from the phase III, double-blinded, placebo- and active comparator-controlled VOYAGE 1 trial.” (2017).J Am Acad Dermatol. Mar;76(3):405-417. 2. Reich K, et al. Tildrakizumab versus placebo or etanercept for chronic plaque psoriasis (reSURFACE 1 and reSURFACE 2): results from two randomised controlled, phase 3 trials. (2017) Lancet. Jul 15;390(10091):276-288. 3. Papp KA, et al. 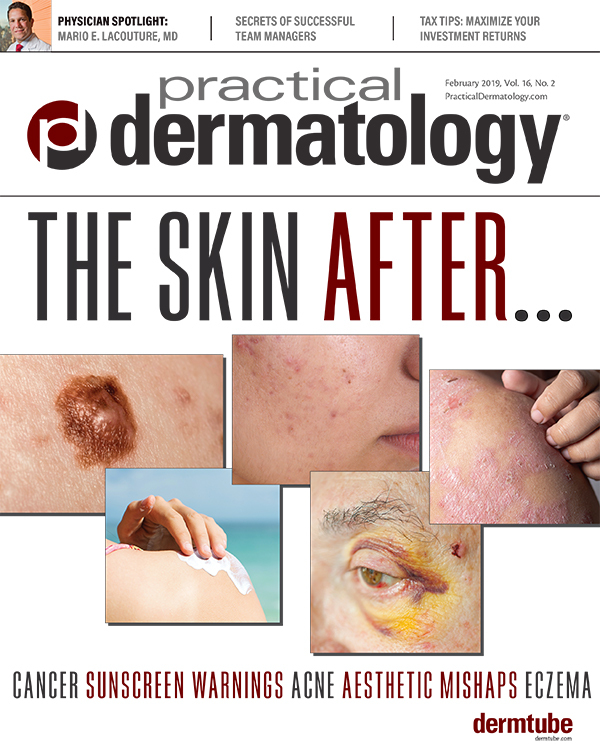 Risankizumab versus Ustekinumab for Moderate-to-Severe Plaque Psoriasis. (2017) N Engl J Med. 2017 Apr 20;376(16):1551-1560. Jerry Bagel, MD, MS is Director of the Psoriasis Treatment Center of Central New Jersey. He recently received the Excellence in Leadership Award from the National Psoriasis Foundation (NPF).